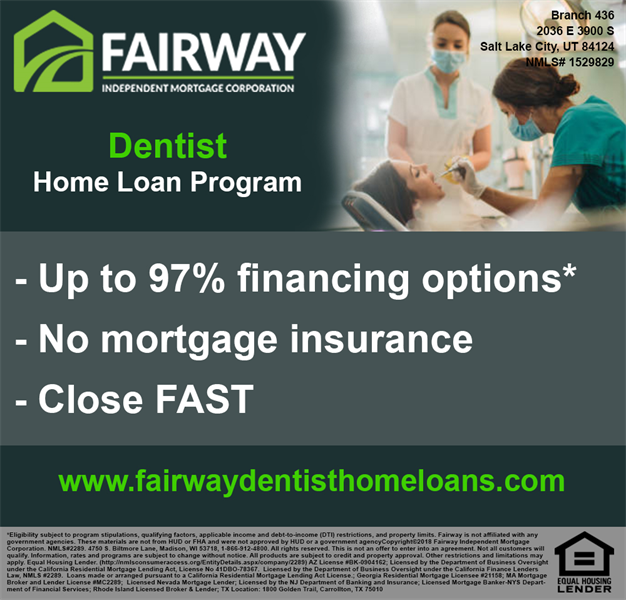 Through our experience working with thousands of dentist and other medical professionals we have gained a deep understanding of the unique challenges you will likely face while getting a home loan. We are here for any question you may have! We’ve all seen the ugly home in the perfect neighborhood that desperately cries for some love and attention. These homes are literally THE diamond in the rough. If someone has the passion and creativity to modernize and make them new again, they can represent a significant opportunity to the homeowner. Or maybe you stumble upon a home that was mid remodel, sitting in a condition that most banks won’t finance until the renovation is completed. Whether you are looking to purchase that diamond in the rough, needing a complete gut and remodel (maybe even an addition or pool added), or you find a home that due to property condition most banks won’t touch, Fairway has lending solutions for almost any property condition issue. Our home loan programs allow you to purchase a new home and immediately fund the renovation (available for refinances as well), or set up an escrow account for minor repairs that can be completed after closing. Our purchase programs allow as little as 3% down. If you are an existing home owner looking to refinance, no cash out of pocket is possible as long as your home has at least 5% equity. How a renovation loan can help. The renovation loan allows you to buy virtually any existing home and fund the construction all in one loan. It also allows for you and your family to remain in your current home or rental, as the construction occurs and your new home is transformed. Many clients are able to free up their capital from their existing home via a home equity line of credit, which is an acceptable source of down payment on the new renovation loan. To top it off, it’s possible to finance up to six months interest payments on the new home, right into the construction loan so you avoid making double mortgage payments while the home is built. We’ve also teamed up with several local real estate groups that are actively prospecting choice neighborhoods for off market listings (pocket listings). Many of these would be sellers feel locked into their home because they have significant deferred maintenance and they feel they cannot list or sell their homes until they have made the home presentable. Our local real estate professionals have created a database of sellers that would love to sell if they didn’t have to do anything to improve their homes and could still get a fair current condition price. Lastly, we have several general contractors whom have successfully completed the Existing-Home Construction Loan program and are already approved to administer the program. Resumes and introductions are available upon request to both the local realtor groups and general contractors. There are certainly more moving pieces to this type of transaction than there is with a simple buy and sell situation. I would invite you to request a no cost consultation with one of our Construction Loan Officers, whom can answer your questions and tell you if you will qualify for the program. Copyright©2019 Fairway Independent Mortgage Corporation. NMLS#2289. 4750 S. Biltmore Lane, Madison, WI 53718, 1-866-912-4800. All rights reserved. This is not an offer to enter into an agreement. Not all customers will qualify. Information, rates and programs are subject to change without notice. All products are subject to credit and property approval. Other restrictions and limitations may apply. Equal Housing Lender. AZ License #BK-0904162. Licensed by the Department of Business Oversight under the California Residential Mortgage Lending Act, License No 41DBO-78367. Licensed by the Department of Business Oversight under the California Finance Lenders Law, NMLS #2289. Loans made or arranged pursuant to a California Residential Mortgage Lending Act License. Licensed Nevada Mortgage Lender. Licensed by the NJ Department of Banking and Insurance. Licensed Mortgage Banker- N.Y.S. Department of Financial Services. Rhode Island Licensed Broker & Lender.